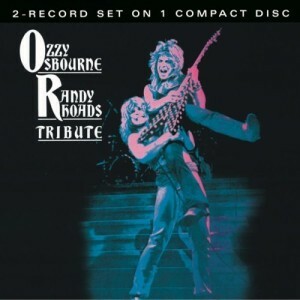 this live double album, released five years after randy rhoads' death, showcases a hard rock guitarist whose all-around ability was arguably second only to eddie van halen. osbourne leads his best band lineup through the entire blizzard repertoire, plus a few diary and sabbath numbers. of special note are rhoads' unaccompanied solos, leaving no doubts about his virtuosity, and the studio outtakes of his short solo piece, "dee." rhoads' entire output is absolutely essential for guitar freaks, but he sounds even better live than in the studio. all cds are original releases and will come with jewel case and original artwork unless otherwise noted. mint = the cd itself is in 'as new' condition with no surface marks or deterioration in sound quality. the artwork is in perfect condition. excellent = the cd shows some signs of having been played, there may be some light marks that do not affect playback or sound quality. the artwork might have slight wear. very good = the cd has quite obviously been played many times, but displays no major deterioration in sound quality, despite many noticeable surface marks and the occasional light scratch. normal wear and tear on the artwork, without any major defects is acceptable. good = the cd has been played so much that it is heavily marked but guaranteed to play through. the artwork suffers from folding, scuffing of edges, spine splits, discolouration, tears, etc. (should this be the case the description should specify the fault). * please note that we often use the uk muze cd information for our items. this is simply to expediate the listing process. please check the item description for the correct import status and original release date as well as any further specific information. please check our ebay shop for more of our items and also feel free to visit our about me page to find out more about us! please make one single payment after you have made all of your selections! international payment via paypal only! payment is expected within 5 days of the end of the sale. while we feel this is a reasonable amount of time we understand that delays can happen. if for any reason you are unable to pay on these terms, please contact us! we will gladly accommodate requests for more time if you simply get in touch. if no payment or contact is made within 7 days, an unpaid item dispute will be opened and the item will be forfeited and re-listed. shipping notification is sent to the email address that you have registered with paypal. if paying by an alternate method, shipping notification will be sent to email address registered with ebay. all items are carefully packaged in bubble mailers. we regret that due to the dramatic increase in postage prices we can no longer offer free postage on our discount deals. we are charging as little postage as we possibly can in order to ensure that you are still getting a great deal. ** not all items will ship to all locations. if you are interested in an item that does not currently ship to your location, please contact us regarding the specific item and we will get back to you! *** postage rates for larger sets may be higher. please see specific item p&p details. we deal primarily in used cds and we are very careful to describe each item honestly in all of our listings. please review the grading system that we use under the about us section of all listings. all orders are carefully packaged in bubble mailers and posted in the condition listed. we also obtain proof of postage for each order that we ship. sound as a pound sounds strives to live up to its name by doing our best to ensure that all of our cds play perfectly. even so, mistakes sometimes happen! if you receive your item and find that it is faulty or feel that the condition varies drastically from our description of it (check our rating guide before purchasing), please contact us within 7 days with your concerns and we will respond. in the event that you do not want the item, you are welcome to return it to us for a full refund. we do our very best to package your items safely and ship them quickly. sadly we cannot account for the handling of your parcel by the postal services! if your item arrives damaged or if your item has not arrived within 14 working days (28 for international buyers), please contact us with details of your item. we will refund your purchase or send a replacement as soon as a successful claim has been made with the royal mail or other postal service. if you receive your item and find that it is faulty or feel that the condition varies drastically from our description of it, please contact us within 7 days with your concerns and we will respond. if you do not want the item, you are welcome to return it to us within 14 days for a full refund of the purchase price.